It seems like every time you turn on the t.v. or look through current events on-line someone is talking about MRSA! You hear it’s in the hospitals, schools, locker rooms, but…what the heck is it? MRSA is an abbreviation for Methicillin Resistant Staph Aureus. This term simply means that a bacteria called Staphylococcus Aureus (AKA “Staph”) is resistant to Methicillin (a penicillin-based antibiotic). 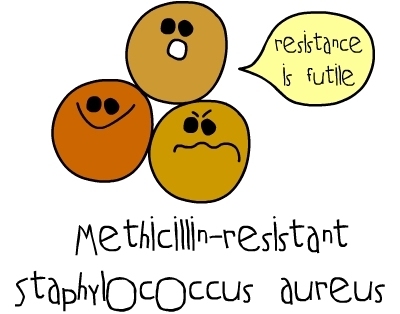 However, Methicillin is not the ONLY antibiotic MRSA is resistant to! MRSA is resistant to almost all standard antibiotics that are prescribed for common infections such as respiratory infections, skin and ear infections. Community-acquired MRSA- MRSA infection that is found in communal areas such as gyms and locker rooms. This type of MRSA responds usually to oral antibiotics; however, it can grow more resistant to oral antibiotics if it is not treated properly. Hospital-acquired MRSA- MRSA infection that has occurred within a medical facility such as a hospital or nursing facility. This type of MRSA is resistant to almost all oral antibiotics and usually requires IV antibiotics. Regardless of the type of MRSA infection, the infection should be treated promptly! Any wound or sore that is not healing or looks like it is getting worse even when you’re taking an antibiotic should be evaluated by a specialist for proper treatment. The best way to prevent transmission of any bacteria including MRSA is keeping facilities clean and WASHING YOUR HANDS! Hand washing is the easiest, cheapest and most convenient antimicrobial available to everyone! If you have a sore that is not healing on your foot, ankle or leg, then call Advanced Podiatry at 813-875-0555. Let the doctors at Advanced Podiatry take a close look at the cause and get you the prompt treatment you deserve today!